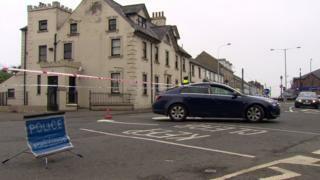 Detectives investigating the death of a man in County Antrim have released a man on bail. The 27-year-old was arrested on suspicion of robbery and assault occasioning actual bodily harm on Sunday. Police have yet to release the name of the man who died at the Simon Community hostel on Henry Street in Ballymena. The cause of his death has not been confirmed. Detectives have seized a number of items for examination.